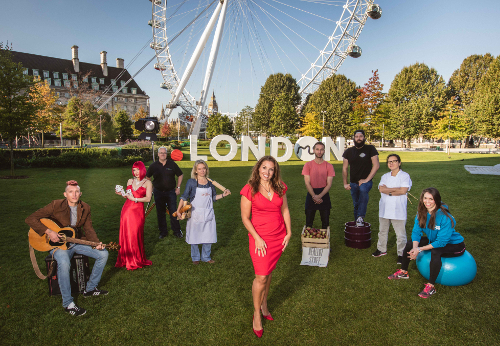 Judges for the inaugural Dot London Small Business Awards, headed by entrepreneur and BBC ‘Dragon’ Sarah Willingham, have narrowed down a list of hundreds of entries to cover the competition’s 12 categories. It is now down to the general public to visit www.awards.london and decide which London-based small businesses will be crowned Dot London Small Business Awards 2015 winners – voting opens at 5pm on 17th November and closes at 5pm 8th January 2016. The Awards aim to recognise a range of industries through the 12 categories, from Best Places to Eat and Drink, to Creative Agency of the Year and Best Social Enterprise. The winners of each category will receive a boost of £1,000, one-to-one mentorship on how to improve their online business presence from category sponsors, such as 123-Reg, GoDaddy, Heart Internet and UK2, and a free Dot London domain name for a year*. There is an additional prize for the winner of the Young Entrepreneur of the Year award of a year-long membership to the Federation of Small Businesses. Joining Sarah Willingham on the judging panel are the leading business minds behind some of London’s most successful brands including health-led fast-food chain, LEON; folding bicycles pioneers, Brompton Bikes; online designer furniture retailers, Made.com; craft beer brewers, Meantime Brewery; and fashion and gift retailer, Oliver Bonas. Amongst the categories is the Dot Londoner of the Year award which, unlike the others, is only open to businesses with a Dot London web address. The six finalists in this special category are: Birdsong, social enterprise and online fashion outlet selling hand-made clothes and accessories; DrinkUp.London, festival organisers and listings website for the capital’s best bars; I AM A, British stationery gifts company; Ma Baker, micro bakery and tutor; MyPie, street food vendor; and YogaRise, Peckham based yoga studio. According to recent data from the Office for National Statistics (ONS)**, London has the highest concentration of small businesses in the UK with over 436,210 small businesses registered in London in 2015, 43,600 more than the previous year, making up a staggering 98 percent of all companies registered in the capital. Since its launch last year, a number of leading London icons and businesses are now using Dot London web addresses, including visitor attractions, ZSL London Zoo and Museum of London; the newest edition to the city’s skyline, Sky Garden; and Europe’s leading venue for meetings and exhibitions, ExCeL London. The public voting will close at 5pm on 8th January 2016 and the winners will be announced at the Awards ceremony on 21st January. For more information about the Dot London Small Business Awards and to vote visit www.awards.london.